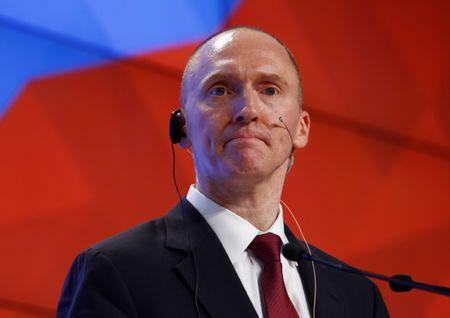 WASHINGTON (Reuters) - The FBI on Saturday released documents related to the surveillance of former Trump presidential campaign adviser Carter Page as part of a probe into whether he conspired with the Russian government to undermine the 2016 U.S. election. The 412 pages, mostly heavily redacted and made public by the Federal Bureau of Investigation late Saturday, included surveillance applications to the Foreign Intelligence Surveillance Court and warrants surrounding the investigation into Page. "The FBI believes that Page has been collaborating and conspiring with the Russian Government," the surveillance application filed in October 2016 said. The documents released include applications and renewal warrants filed in 2017 after Trump took office. Page has denied being an agent of the Russian government and has not been charged with any crime. Earlier Saturday, the New York Times reported it had received a copy from the Justice Department after it and other news organizations had filed suit. The documents released said "the FBI believes that the Russian Government's efforts are being coordinated with Page and perhaps other individuals associated with" Trump's campaign. It added Page "has established relationships with Russian Government officials, including Russian intelligence officers." Republicans lawmakers have contended that the FBI made serious missteps when it sought a warrant to monitor Page in October 2016 shortly after he left the Trump campaign. House Democratic Leader Nancy Pelosi said on Saturday that "these documents provide clear evidence of 'Russia's coordination with Carter Page,' a high-ranking Trump campaign official, 'to undermine and improperly and illegally influence the 2016 U.S. presidential election.'" Last week, a federal grand jury charged 12 Russian intelligence officers with hacking Democratic computer networks in 2016, in the most detailed U.S. accusation yet that Moscow meddled in the presidential election to help Trump. Earlier this year, thirteen other Russians and three Russian companies were indicted on charges of conspiring to interfere with the election. Michael Horowitz, the department's inspector general, said in March that he would review whether the FBI and the Justice Department followed proper procedures when they applied for a warrant to secretly conduct surveillance on Page and his ties to Russia. Republicans have claimed that the FBI used in part a dossier compiled by former British intelligence officer Christopher Steele to justify the warrant, and failed to disclose to the court that Steele was employed by a firm funded by Democrats to do opposition research on Trump's business dealings.